The New York Times published a report Thursday detailing the strained relationship between former F.B.I director James Comey and narcissistic toddler President Donald Trump and painting a pretty clear picture of Trump’s attempt to wheedle his way into Comey’s affections. To his credit, Comey tried very, very hard to avoid Trump’s advances, citing decorum and protocol, which dictate that requests for information from the president to the F.B.I go through the Justice Department and that the two keep each other at arm’s length at best. Clearly unaccustomed to many aspects of his new job, and hell-bent on relying on glad-handing and smarm to curry favor and “make deals,” Trump repeatedly tried to get Comey on his side, via, among other things, a dinner where he asked Comey to pledge his loyalty, all while Comey was overseeing the investigation into Russian interference in the election. Many of the interactions between Comey and Trump were detailed in the extensive memos that Comey kept and distributed amongst his staff. Hopefully one day soon, we will have a clearer idea of what precisely is in those goddamned memos, but until then, the Times brings us this story, courtesy of Benjamin Wittes, editor in chief of the Lawfare blog, fellow at the Brookings Institute and friend of James Comey. Comey reportedly told Wittes that he spent the first two months of Trump’s presidency trying to keep his distance from the White House and rejecting the thirsty advances of Trump, clearly desperate to form a personal relationship with the FBI director. Comey demurred, Trump insisted and then, at a ceremony to honor law enforcement officials that worked the inauguration, the following event occurred., emphasis ours. The ceremony occurred in the Blue Room of the White House, where many senior law enforcement officials — including the Secret Service director — had gathered. 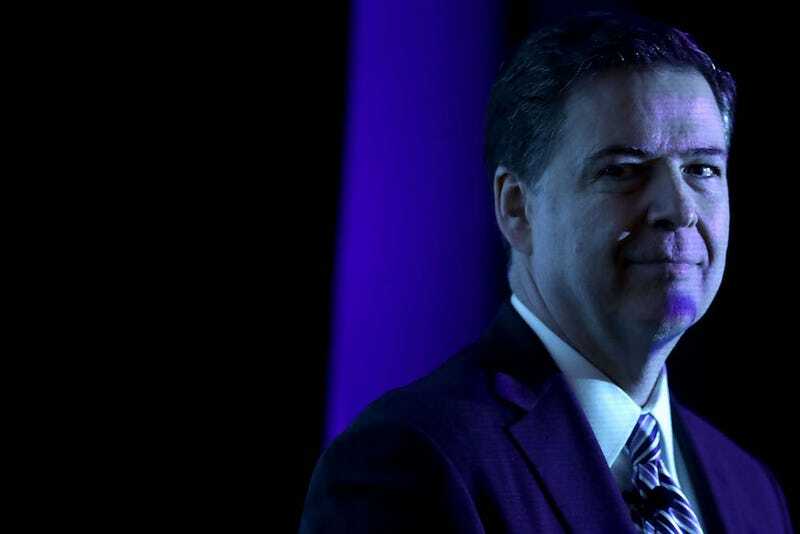 Mr. Comey — who is 6 feet 8 inches tall and was wearing a dark blue suit that day – told Mr. Wittes that he tried to blend in with the blue curtains in the back of the room, in the hopes that Mr. Trump would not spot him and call him out. “He thought he had gotten through and not been noticed or singled out and that he was going to get away without an individual interaction,” Mr. Wittes said Mr. Comey told him. But Mr. Trump spotted Mr. Comey and called him out. The Times provided video, in which you can clearly see Comey standing very still against a blue curtain, in a poor attempt at camouflage. Trump calls him out, extending his arms to fold the tall man in his embrace, but Comey curves the hug and goes in for a reluctant handshake. All of this is normal, guys. It’s all normal. Completely normal and fine.